The world is the body and Delhi its soul," wrote the poet Mirza Ghalib about the city he loved and lived in. And, as the soul is hard to describe, so is Delhi, this city with hundreds of years of history. 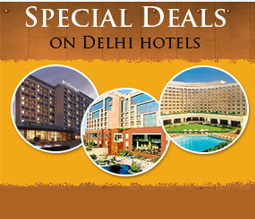 As a political city and the capital of the country, Delhi is also an administrative unit in itself. It houses the power structure, the ministries and the parliament. And, perhaps the most special of all, it offers a variety of cultural activity of dance and music shows of the highest caliber. India Gate Delhi is said to have been a kingdom of the Gods long before man discovered it. Nestling between the Aravalis on its south and northwest and the Yamuna on its east, it provided the perfect settlement even for early man. The legendary capital of the Pandavas called Indraprastha, was here found within the parameters of the Purana Qila. This was in 1000 B.C. The next few centuries saw a constant settlement in Delhi, one in which various kings vied for the rights to this incomparable city. The remains of these kingdoms and the ruins discovered in recent years make up the seven ancient cities of Delhi. To see Delhi then is to look into the glimpses of its past and the fine monuments and buildings its invaders have left through the centuries. The walls of the Qutab Minar and its surrounding areas make up the first city. First ruled by The Tomar kings in 1060 then taken over by the Rajput Chauhans in the 12th century, this area was taken over by Qutb-ud-din Aibak who captured Delhi in 1193 AD. At the end of the 13th century the Khilji dynasty built their new capital at Siri - the second city of Delhi. Here, along with the historical remnants of the Khiljis, are new and modern buildings - the Asian Games Village and the Siri Fort Auditorium which bear witness to a different kind of history: the Asian Games in 1982. The third city of Delhi, Tughlakabad, was built inside a great fortress with 13 outer gates. This huge structure was built over a span of just five years during the reign of Ghiyas-ud-din from 1321-25. His tomb is across the road from the main entrance to the fort. The fort itself was later abandoned, possibly because of the shortage of water. The fourth city of Delhi, Jahanpanah, was built by Muhammed Bin Tughlak. But soon after it was built, Tughlak decided to transfer his capital from Delhi to Daulatabad in Deccan. It was a long and difficult march of 1120 kilometers. Many of his soldiers died in this march and when Tughlak had to finally concede his error in judgment, Delhi resumed its status as capital. Few remains of the fifth city of Ferozabad can be found today. This was built by Feroz Shah Tughlak in 1351, on the banks of the river Yamuna, and later demolished by Shah Jahan to build Shahjahanabad. Tomb and monuments of the Lodi and Sayyid dynasties lie within the Lodi gardens- the sixth city. Old Delhi is the seventh cities. The red fort was built by Shah Jahan who selected masons and craftsmen from all over the country for this task. Red sandstone was especially brought in from Agra. This fort was defended by 14 massive gates of which only five remain. The Capital alternated between Agra and Delhi during these years and soon after the British established themselves it was removed to Calcutta. It was only in 1911 that Delhi resumed its position and the architects, Edward Lutyens and his colleague; Herbert Baker envisaged their plan for the city. They designed the Rashtrapati Bhawan and its surrounding areas in a style meant to be the best combination of Indian, Roman and English architecture. From there on began the new cities that embody Delhi. The buildings reaching for the sky, the numerous hotels and shopping centers. Connaught Place, built in 1931, set the motion for the development of New Delhi. Now, shopping centers have sprung up in virtually every colony. Delhi continues to spread out fast including the far-flung suburbs and even some former forest areas.